The year of the Ram is coming to a close; it will be remembered as a year of SARS, flu, fire, floods, wars and terrorism. The year of the Monkey is just around the corner, the Chinese community will celebrate the Chinese New Year on January 22. What are we going to expect in the next 12 months? The year of the Monkey in Chinese calendar is Jia (Wood) Shen (Metal) year, the hexagram for 2004 is Qian (Humbling). The Yi Jing is teaching us to be humble, modest, upright, careful, share what we have, co-operate and listen to others in the coming year in order to avoid unnecessary confrontation, lawsuits or war. It will be a year of unrest and changes due to the monkey's nature, therefore earthquakes, collapses of buildings, terrorist activities and lawsuits may occur. The travel industry should do better despite the security threat. The stock market will be quite volatile this year except the metals, banking, automobiles and high tech stocks. It should stabilize in 2005. 2004 will be a tough year for the farming industry due to the warm weather and not enough precipitation in the past three winters. We can expect colder winter for the next few years starting 2004. The year of the Monkey may also be a year for medical check-ups on your heart, your eyes, your blood pressure and your cholesterol. With San Sha (3 killings) coming to the South, heart problems, eye problems, strokes, blood disease and headaches may replace the SARS and flu epidemics of 2003 in 2004 as the major health concern worldwide. Marriage maybe another big issue in 2004, spousal relationship should be handled with extra care and tolerance. If the main door of your house or your bedroom is in the South, you may experience the above problems or other difficulties unless you know how to deal with the San Sha. You can deal with this evil energy by placing a plant and a bucket of water next to the plant, all in the South, or place 3 metal Chinese unicorns in the South. The Tai Sui (Grand Duke) will be in Southwest (Shen SWS) and Sui Po will be in Northeast (Yin NEE), these two locations should avoid any disturbance, digging, construction or addition. To deal with the Tai Sui, you can place a pair of metal Chinese unicorns in these 2 locations. If the main door of your house is in these locations, you may experience some problem including accidents. 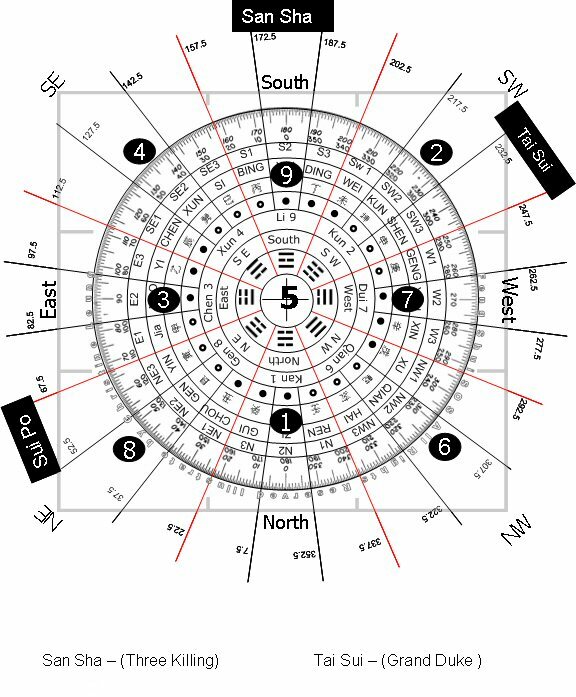 Based on Chinese Flying Stars Feng Shui theory, the evil star "5" will be in the centre this year therefore try to minimize activity in the central area of your house. Avoid any disturbances including renovations in this area. The evil 5 can be dealt with by using the salt-water-coin cure. Another area we need to be careful with is the Southwest area. If your main door or bedroom is in the Southwest, there may be health problems. This can be dealt with by placing a metal calabash in the Southwest. The East may become an area of concern regarding arguments. To remedy this you can place something "Red" in the East. To avoid unnecessary lawsuit, you can place something "Blue" in the West. To enhance the financial prosperity, you can put a citron crystal in the Northeast location, or put six Chinese coins in a ceramic vase with clear water and place it in the Northwest. You can also do some renovation in the Northwest or East sector to bring in wealth. For career persons or school children, place 4 stalks of Chinese lucky bamboo in the due North location, you can also place your photo and a piggy bank here for your career. For single person, you can place 7 white or golden color flowers in a metal vase, place it in the due West location, you may find your loved one.